Indications: (forceful) Stagnation, cold, tumor or masses: pathogenic factors stagnate within the vessels, block blood circulation. (Forceless) Heart qi deficiency (+pathogenic factor): qi and blood are not sufficient to fill the vessels, making it easier for pathogenic factors to fill the vessels leading to the slow irregular pulse. Explanation: again, with a forceful slow and irregular pulse, there is a likelihood of a pathogenic factor stagnating the flow of qi and blood through the vessels. Because the slow pulse suggests cold, the pathogenic factor is likely cold in nature. Cold can constrict and contract, and ultimately lead to the appearance of tumors or masses when this condition is unaddressed for a longer time. In the case of the forceless slow irregular pulse, again we’re looking at a deficiency of the Heart’s ambien to buy function of dominating blood circulation. Should the Heart be unable to push the blood around, the vessels can be emptied leaving room for opportunistic cold to enter the vessels and obstruct the movement of blood in a natural, regular rhythm. 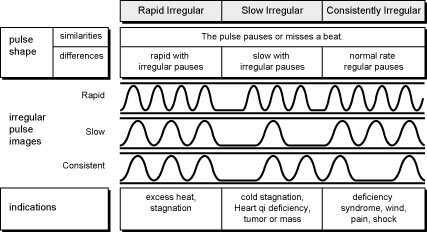 The source text suggests that the (forceless) slow irregular pulse indicates a deficiency of Heart qi (with pathogenic cold) in particular. Alism: because I find mechanisms to be more important (flexible, insightful, and practical) than a simple list of indications, I would also propose that the forceless slow and irregular pulse could quite easily be due to a deficiency of Heart yang, especially when arising with symptoms of (deficiency) cold as we would normally see with any yang deficiency. Next: the deficient, empty, or vacuous pulse.